Solanaceae is a family of flowering plants in the Solanales order, characterized by five-petaled flowers, typically conical or funnelform, and alternate or alternate to opposite leaves, and including some of the more important food and drug-producing plants, including potato, tomato, eggplant, tobacco, chili pepper, and deadly nightshade. This family is known as the potato or nightshade family, and the name nightshade sometimes is used as the common name in general for plants of this family, although often the name nightshade is reserved for members of the genus Solarum. Solanaceae includes over 3,000 species of annual plants and perennial plants, vines, herbaceous plants, sub-shrubs, shrubs, and some trees. The Solanaceae family is characteristically ethnobotanical, that is, extensively utilized by humans. It is an important source of food, spice, and medicine, and many plants are used as ornamentals, including the petunia and butterfly flower. In economic importance, Solanaceae is the third most important plant taxon and the most valuable in terms of vegetable crops (SGN). It also offers the most variability in terms of crop species, including tuber-bearing crops (potato), fruit-bearing vegetables (tomato, eggplant, peppers), leaf vegetables (Solanum aethiopicum, S. macrocarpon), and medicinal plants (eg. Capsicum) (SGN). Members of Solanaceae provide stimulants, poisons, narcotics, pain relievers, and so forth. Solanaceae species are often rich in alkaloids that can range in their toxicity to humans and animals from mildly irritating to fatal in small quantities. The Solanaceae family comprise about 3000 to 4000 species of flowering plants, placed within about 90 genera (NHM 2008). They are found on all continents except Antarctica, with major species diversity in Central and South America, with greatest species diversity near the equator (NHM 2008; SGN). Other ares of diversity include Australia and Africa (NHM 2008). The Solanaceae are believed to have arisen in the Andean/Amazonian regions of South America (SGN). They occur and are believed to have evolved in very diverse habitats, including rain forests that receive over three meters of rainfall annual, to deserts that receive almost no rainfall, to mountains that experience snow and subfreezing temperatures (SGN). Members of this family vary greatly in terms of morphology, ecology, and habit. In general, they exhibit the following morphological characteristics. Flowers are typically conical or funnelform with five petals, usually fused. The leaves are alternate, often with a hairy or clammy surface. Solanaceous plants produce a fruit that is either a berry, as in the case of the tomato or wolfberry, or a dehiscent (breaks open upon drying, or dehiscing, releasing the seeds) capsule as in the case of Datura. The seeds are usually round and flat, being two to four millimeters in diameter. The stamens are usually present in multiples of four (most commonly four or eight). The ovaries are inferior. The hypogynus gynoecium is a syncarp located obliquely in relation to the median. Many of the plants are edible, while others are poisonous. Some have both edible and toxic parts. The potato, a well-known food crop, likewise contains glycoalkaloids, toxic compounds of which the most prevalent are solanine and chaconine. Cooking at high temperatures (over 170 °C or 340 °F) partly destroys these. The concentration of glycoalkaloid in wild potatoes and raw potatoes suffices to produce toxic effects in humans. The name of the family comes from the Latin Solanum "the nightshade plant," but the further etymology of that word is unclear; it has been suggested it originates from the Latin verb solari, meaning "to soothe." This would presumably refer to alleged soothing pharmacological properties of some of the psychoactive species found in the family. It is more likely, however, that the name comes from the perceived resemblance that some of the flowers bear to the sun and its rays, and in fact a species of Solanum (Solanum nigrum) is known as the sunberry. The family is also informally known as the nightshade or potato family. The family includes the Datura or Jimson weed, eggplant, mandrake, deadly nightshade or belladonna, capsicum (paprika, chili pepper), potato, tobacco, tomato, and petunia. The Solanaceae are known for possessing a diverse range of alkaloids. As far as humans are concerned, these alkaloids can be desirable, toxic, or both, though they presumably evolved because they reduce the tendency of animals to eat the plants. One of the most important groups of these compounds is called the tropane alkaloids. The term "tropane" comes from a genus in which they are found, Atropa (the belladonna genus). The belladonna genus is named after the Greek Fate, Atropos, who cut the thread of life. This nomenclature reflects the toxicity and lethality that has long been known to be characteristic of these compounds. Tropane alkaloids are also found in the Datura, Mandragora, and Brugmansia genera, as well as many others in the Solanaceae family. Chemically, the molecules of these compounds have a characteristic bicyclic structure and include atropine, scopolamine, and hyoscyamine. Pharmacologically, they are the most powerful known anticholinergics in existence, meaning they inhibit the neurological signals transmitted by the endogenous neurotransmitter, acetylcholine. Symptoms of overdose may include mouth dryness, dilated pupils, ataxia, urinary retention, hallucinations, convulsions, coma, and death. Despite the extreme toxicity of the tropanes, they are important drugs when administered in appropriate (and extremely small) dosages. They can reverse cholinergic poisoning, which can be caused by overexposure to pesticides and chemical warfare agents such as sarin and VX. More commonly, they can halt many types of allergic reactions. Scopolamine, a commonly used ophthamological agent, dilates the pupils and thus facilitates examination of the interior of the eye. They can also be used as antiemetics in people prone to motion sickness or receiving chemotherapy. Atropine has a stimulant effect on the central nervous system and heart, whereas scopolamine has a sedative effect. Cocaine is also considered a tropane alkaloid due to its structural similarity to the aforementioned compounds. Its pharmacology, however, is radically different, and it does not occur in the Solanaceae family. One of the most famous alkaloids from the Solanaceae family is nicotine. Like the tropanes, its pharmacology acts on cholinergic neurons, but with the opposite effect (it is an agonist as opposed to an antagonist). It has a higher specificity for nicotinic acetylcholine receptors than other ACh proteins. Its effects are well known. Nicotine occurs naturally in the Nicotiana or tobacco genus. Capsaicin is structurally unrelated to nicotine or the tropanes and is found in the genus Capsicum, which includes chili peppers such as tabasco peppers and habaneros. The compound is not appreciably toxic to animals. However, it stimulates specific pain receptors in most mammals, those which sense heat, in the oral mucosa as well as many other epithelial tissues. This causes a sensation of burning not unlike an actual heat or chemical burn. It is used in high concentration as a deterrent in pepper sprays, and sought after for many culinary dishes for its "spiciness." The "hotness" of capsaicin products and foods is expressed in Scoville units. A scoville unit is the factor by which the capsaicin-containing substance must be diluted to render the resulting solution imperceptible to a tester (for example, a teaspoon of a 5,000 Scoville unit hot sauce would have to be diluted with 4,999 teaspoons of a sugar water solution to negate its potential to cause a sensation on the palate). Members of Solanaceae provide a variety of culinary, medicinal, and ornamental values. In terms of culinary value, the most important species of this family for the global diet is the potato or Solanum tuberosum, whose carbohydrate-rich tubers have been a staple food in many times and places, and which is one of the most grown crops today. In many genera, the fruits are the desirable item, for example, tomatoes, tomatillos, eggplants, uchuva, and peppers, such as chili pepper. Medicinally, as well as in terms of poisoning and psychotropic effects, members of Solanaceae have been prized for their alkaloid content and used throughout history (NHM 2008). Important drug plants include deadly nightshade or belladonna (Atropa belladonna), jimson weed (Datura stramonium), henbane (Hyoscyamus niger), and tobacco (Nicotiana tabacum) (NHM 2008). Mandrake, the common name for members of the plant genus Mandragora, contains deliriant hallucinogenic tropane alkaloids such as hyoscyamine and the roots sometimes contain bifurcations causing them to resemble human figures, leading to this plant being used in magic rituals and neopagan religions such as Wicca. As ornamental plants, the genera Petunia, Schizanthus (butterfly flower), Salpiglossis (painted or velvet tongue), and Browallia (Bush violet, Jamaican forget-me-not) are well-known (NHM 2008). 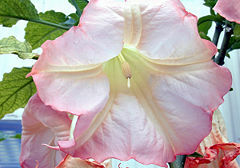 Some plants also are the focus of extensive biological study as model experimental organisms, including the petunia, tobacco plant, tomato, and potato (NHM 2008). While very popular, some people experience sensitivity or allergy-like symptoms in response to nightshade plants. D'Arcy, W. G. 1986. Solanacea. Columbia University Press. ISBN 0231057806. Integrated Taxonomic Information System (ITIS). 1999. Solanaceae ITIS Taxonomic Serial No. : 30411. Retrieved May 25, 2008. Natural History Museum (NHM), London. 2008. About the family Solanaceae Natural History Museum. Retrieved May 25, 2008. Sol Genomics Network (SGN). n.d. About the Solanaceae family Sol Genomics Network. Retrieved May 25, 2008. Solanaceae in L. Watson and M.J. Dallwitz (1992 onwards). The families of flowering plants: descriptions, illustrations, identification, information retrieval. This page was last modified on 9 October 2015, at 14:54.